Goodells County Park provides something for everyone. More and more local residents, visitors, community groups along with area businesses are enjoying the new and the "old" facilities in Goodells County Park. Many activities and meetings take place at the park throughout the year. The summer months are the most active times at the park. The pavilions, barns and buildings can be reserved for private parties or community events by calling 810-989-6960. To see pictures of some of the facilities available to rent click here. The Historical Village, which includes the Columbus Bible Church (1860), Mudge Log Cabin (1863) Murphy/Ryan Farmhouse (1872) and Lynn Township School (1885), stands as an icon of 19th century Americana. 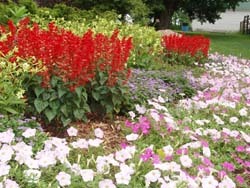 The Butterfly Garden provides colorful habitat for the caterpillar, chrysalis and adult phases of a butterfly’s life. Meadows, berms and the open-air pavilion invite picnics, concerts, kites, frisbees, skiing, sledding and stargazing. There are two playground areas at Goodells County Park. The south playground (near the Quonset hut) features a accessible swing,climbers and more. 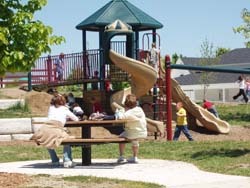 The north playground (near the splashpad) is an adventure area with grassy slopes, high and low places, slides, climbers, swings and talking tubes. It’s accessible to all children and within easy access of Pine River Picnic Pavilion and parking. 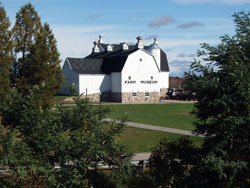 The St. Clair Farm Museum is located in the historic farm barns that are from the old County Farm that once occupied the site. Goodells Park has a water park! The "Splashpad" has 11 spray features that include two water cannons, five dumping buckets, ground geysers, a rainbow water tunnel and more! 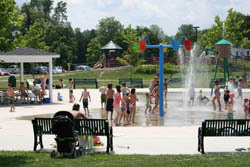 The splashpad is open daily from 10:00am to 8:00pm. The Splashpad is open from Memorial Day through Labor Day. Admission is free! The park hours are 8:00 AM to 10:00 PM daily, all year round. Goodells County Park is located at the center of St. Clair County, close to I-69 and Lapeer Road (Old M-21). Accessible to all, designed for all and good for all. Come and enjoy.